Just because a super hero game is skewed younger, it doesn’t automatically make it bad. The most obvious examples are the various Lego games like the Lego Batman and Lego Marvel series that can be enjoyed by players of all ages, but there’s also the two Batman: The Brave and the Bold titles developed by WayForward and the second Marvel Super Hero Squad title that attempted to copy the Lego formula with the Marvel IP years before Lego Marvel Super Heroes. That’s not to say that there are not cases of these types of titles that older players will get bored with pretty quick like Activision’s movie spin-off game, Spider-Man: Friend or Foe. Teen Titans is a game that unfortunately falls into the latter camp in that it won’t entertain older players for very long however those who are really into the source material may be able to overlook a lot of its short-comings. There was a rule of thumb with the Teen Titans animated series that if its theme song had english lyrics, it meant the episode was going to have more serious subject matter, but if the lyrics were in Japanese, it indicated that the episode would be on the silly side. Teen Titans on the PS2 opens with the theme song to the show with the Japanese lyrics and you can tell from this that the narrative is not to be taken that seriously. When a new video game arrives at the Titans home, it transports them into a video game world and it’s up to the group to find out who put them there and how to get out. Even at its most serious, Teen Titans was far more light-hearted than any DC Comics inspired show that came before it like Batman: The Animated Series or both incarnations of Justice League and the premise is a good fit for the franchises first home console video game adaptation. The issue though is that nothing is really done with said premise until the very end of the game. The scenario opens up a lot of potential for humor that is never really capitalized on in the way that High Moon would do with Deadpool in 2013. There’s a few funny lines of banter dialogue between the team within the levels, mostly involing Starfire, but nothing really derived from the fact that the team is transported into a video game. At the very least the entire cast of the show returns to voice the main team, as are the likes of Ron Perlman who voices Slade (Deathstroke, but he was never called this on the show), so it makes this game feel very much like an extension or lost episode of the show in interactive form. Teen Titans can best be described as a beat-em-up and not a particularly interesting one at that. The game tries to be more than what it is by adding two different types of physical attacks as well as a projectile attack for each Titan and combos that unlock as you progress through the story. The level of challenge is so low however that you’ll get bored fairly fast and see everything the game has to offer in under an hour. The act of attacking waves of enemies feels good and the combos try to help break up the repetitive gameplay but mashing buttons will do you just as good as trying to reliable pull off the simple three-button presses to be more stylish. 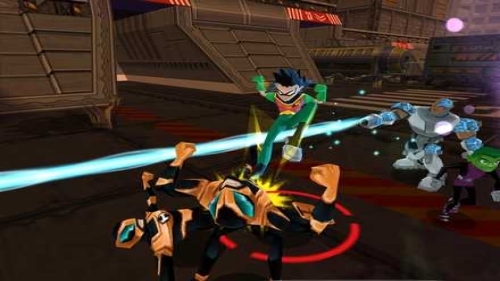 What’s really great about Teen Titans for fans is that save a few circumstances where you’ll have to protect someone briefly from enemies or throw prisoners into a portal that Raven is generating, you can play as your favorite character and freely swap between them using the right and left directional buttons. Everyone is on-screen at all times without any loss of performance when five characters and multiple bad guys are on screen. 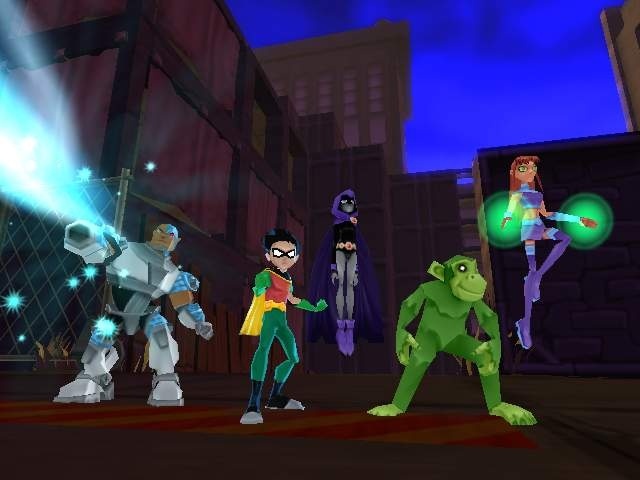 Developer A2M could have had it such that the team was broken up between levels or whatever character you picked is the only one that shows up unless you’re watching a cut-scene, but the fact that they choose to design the game this way shows that while Teen Titans is a game for younger players, it’s one that was made with respect for the property. The way each Titan plays is very similar, which is both a good thing and also a bad thing. Good in the sense that you can easily swap between characters but bad in that it makes someone like Robin feel not that different from Raven. Every character gets the same few moves that become stronger as you progress. There’s a slight difference in the characters: Raven’s charged projectile attack is good for crowd control while both Cyborg and Starfire’s are better saved for characters at a distance, but you can use whoever you want really and you’ll be fine. Teen Titans is a linear game where you’ll be funneled from one fight to the next with no real collectibles to track down, but there’s some incentive to the dedicated to make it to the end of the campaign for the secondary mode, Master of Games. Master of Games is a competitive, 3-D arena fighting game mode that gets additional arenas and a hefty bunch of characters, made up of the Titans, minions and the bosses you fight, added with the more levels you complete. It can be played solo with the computer controlling your opponent or with a friend and for the target audience, it’s a decent enough distraction to keep them playing after they get through the main game. Master of Games is pretty bare bones though, so if you’re expecting something akin to Capcom’s Power Stone with a Teen Titans skin, you’re going to be disappointed. Teen Titans’ graphics don’t pop in the same way that a game like Superman: Shadow of Apokolips do, but they do a well enough job of bringing the colorful, anime inspired aesthetics of the show to 3-D. The characters look the part, but the levels in which they inhabit, things like a prison, train yard, and power plant, aren’t the most interesting and the game doesn’t even comment on how these are tropes of video games which again is a missed opportunity. While there’s no noticeable dip in performance when the screen gets crowded, I did experience a few bugs in my complete play through of the story mode. When prompted to stand on an elevator in a prison stage, the entire team fell through, causing me to have to replay a very tedious stage. During a boss fight the game froze and one of Raven’s lines kept repeating over and over. It allowed me to back out to the menu, but the dialogue was still repeating, causing me to have to turn off the game completely. 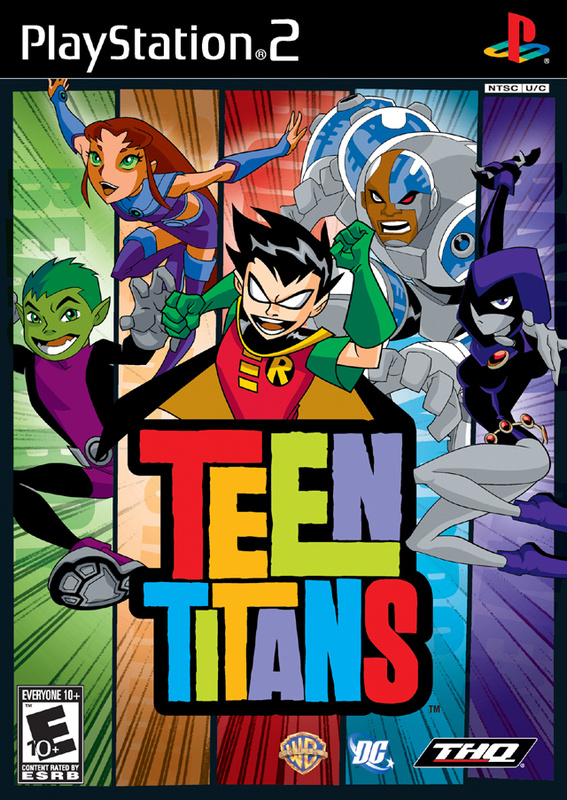 An issue with a lot of licensed games, in particular those based off of animated shows, is that they’re made with little love for the IP and are just something that publishers use to cash-in on a license; That clearly isn’t the case with Teen Titans. While there’s certainly a lot to like about Teen Titans, namely the ability to freely play as whatever member of the team you want and the post game content, the repetitive brawler style gameplay will keep anyone who isn’t very young or a die-hard fan of the show interested for long. This wouldn’t be that bad of a game to track down to give to someone who loves the Teen Titans GO! show that’s still running or to play with your kid if you’re a parent, for everyone else there’s far better super hero themed beat-em-ups.